Certificate from Chenango Memorial Hospital with photo and baby footprints. 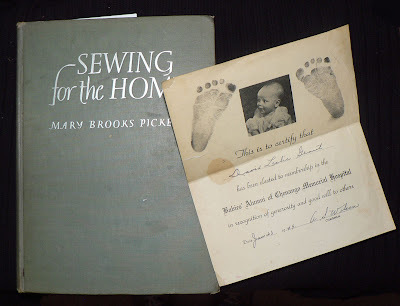 Found in "Sewing for the Home" by Mary Brooks Picken, published by Harper & Bros., 1946. ED: I actually have started making some calls to track down someone who might want this particular FB back. I will keep you all informed if I have any luck. EDIT 2: My notes were wrong on this one, the book it was found in was actually "The Captain’s Chair" by Robert Flaherty, published by Charles Scribner’s Sons, 1938. I probably messed up another post, but I haven't been able to figure out which one. Good for you! I've long maintained that the saddest things to find in antique shops are baby photos and wedding photos. Posting this to my blog - hopefully someone will stumble across it and recognize the baby.